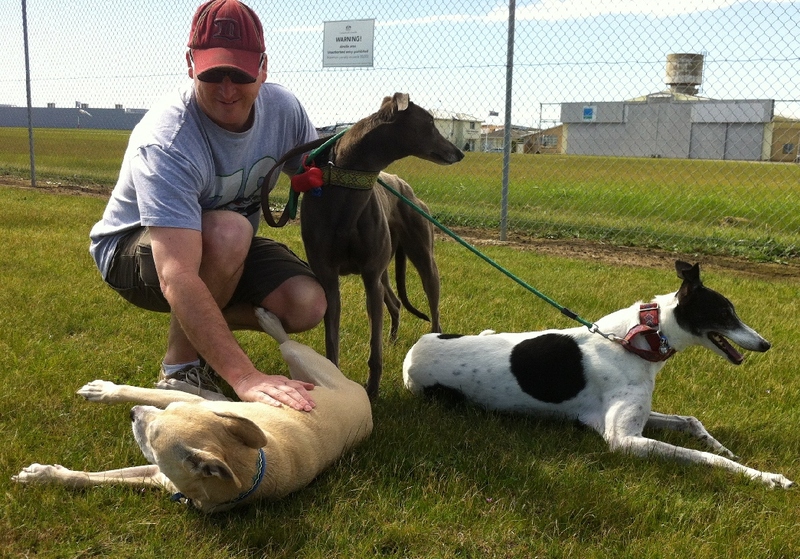 Our love affair with greyhounds started in September 2010. We had previously decided that our next dog would be a greyhound as we had a friend who had adopted one and she was beautiful. 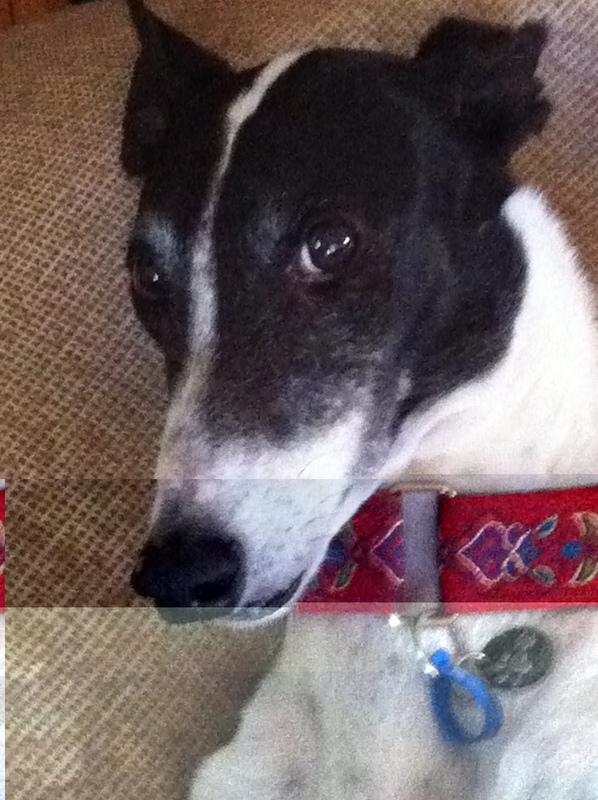 We’ve always adopted pets from shelters so saving the life of a greyhound fitted with our beliefs. But we didn’t realise that day would come as quickly as it did, as our two dogs, Ralph and Rupert, were only three years old. Instead of telling you all about us and how much we love greyhounds, we’ll let April, our first greyhound tell you our story. Hi, I’m April! It all began in NSW in 2002. My mum Stacey gave birth to my sisters Shawee and Baby, my brother Milagro and me. When I was being born, I got a bit stuck and had to be pulled out. Unfortunately it did some damage to my foot and it’s never been normal since. We grew up with a trainer and he and his wife were good to us. As we grew from gangly, short-nosed pups, our owner could see that my siblings had inherited their mum and dad’s good racing pedigree and started their training. It all seemed very glamorous to me, but because of my club foot I did not join them. I had to wait in the backyard for them to come home and tell me all about the outside world. They were given lovely racing names, but I was only ever called April, after the month in which we were born (not much imagination there!) as it had become obvious that I would never race. I could only hop around on 3 legs most of the time as it hurt to put my foot on the hard services. If was on grass or chasing my siblings, I forgot about the pain and used all 4 feet! Despite my obvious disability, I grew into a handsome girl who looked just like my mum and sister and was pretty happy about life – nothing much fazed me and I enjoyed spending time with my family. We were some of the lucky ones – our owner kept us even past the time we could win any races, and of course I couldn’t ever do anything but be sweet and hop around a lot. Eventually, however, in early 2010, hard times fell on our owners and they couldn’t keep us anymore. Janet and Peter from Greyhound Rescue took us in as a family (including Princess who is my half sister from an earlier litter) and let us live with them for a while with all their other dogs. It was fun, but there were so many of us they had to find us new homes. Shawee, Baby, Princess and Milagro were all found lovely forever homes quite quickly but mum and I were going to be a bit of a problem. Mum was now nearly 14 years old and I was 8 and had special needs as far as my leg was concerned. On the saddest day of my life, my beautiful mum Stacey passed away in September 2010. I didn’t understand what had happened and was very stressed. For the 8 years of my life I’d never been apart from mum and my siblings and now I found myself alone. What would become of me? Who would want an old girl who couldn’t go for very long walks? And then it happened – the start of the rest of my life! 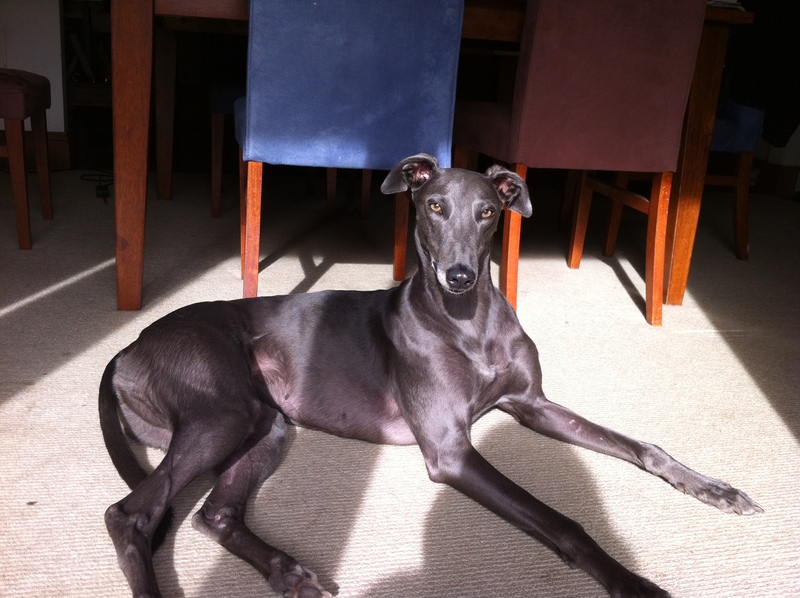 Kylie and Mike in Melbourne had been considering fostering a greyhound a year and a half after their beautiful dog Ralph passed away aged 4 from lymphoma. They didn’t know if they were ready to have another dog but Ralph’s brother Rupert had been depressed since the loss of his best mate and they thought a new friend might cheer him up. So they contacted Greyhound Rescue and thought they’d try fostering for a while to see how everyone got on. Next thing I knew I was on a plane (that was a bit weird!) 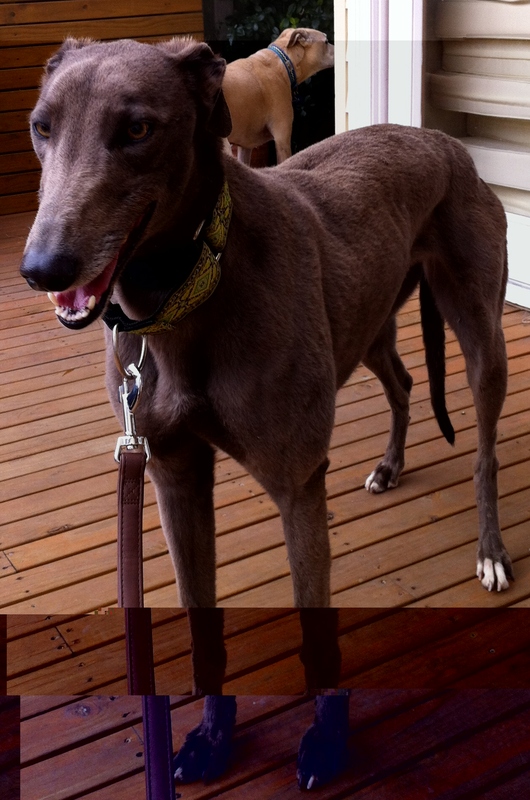 to Melbourne and a couple of days later Kayleigh from Greyhound Rescue took me to meet my new family. Rupert (I now call him Rupie) is a cutie – he was a bit wary of me at first and bossed me around a bit to let me know it was his place and he’d lay down the ground rules – fair enough, I reckon. I was just happy to have a new friend and some owners who really love me. When it came time to put me up for adoption, it seemed I had wormed my way into the hearts of my new family – they say I am quite a character and make them laugh – and they decided they could not let me go to yet another home, so they made the adoption official. 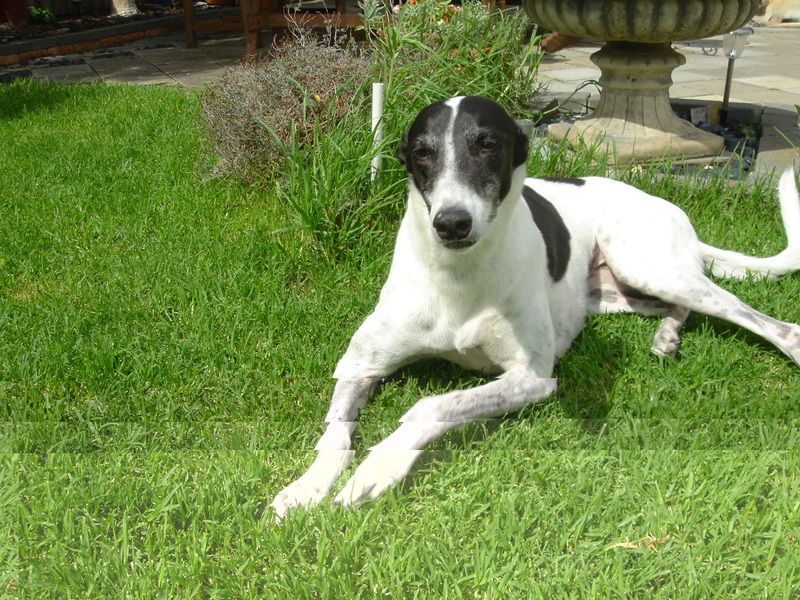 Two years later, Martina from Kay’s Greys (now Amazing Greys) put out a desperate call for a foster carer for a young dog who needed rescuing from a trainer’s kennels. Kylie and Mike had fallen for me big time (and who wouldn’t??) and they couldn’t bare to see a dog at risk of being killed. So, they offered to take in New Girl (she didn’t even have a name) and in a few days, we had a skinny, dirty, woolly, frightened young girl living in our house. Rupie liked her straight away and I guess I did too, but she was a bit scared of us, of Kylie and Mike and every single noise that she heard. We named her Billie, and gradually, with lots of love, encouragement and space, she came out of her shell and became part of the family. When it came time to put her up for adoption… well, Kylie and Mike foster failed again! So she was officially adopted by us in October 2012. Now we couldn’t imagine life without her – she’s always wandering around, checking to see that everyone’s ok, gives gentle little kisses on noses, hogs the bed and steals all the attention when we have visitors because she is now so beautiful. The ugly duckling has grown into a graceful swan. She’s only three years old and likes to play which has kept Rupie and I from growing into old grumps. We have a lot of fun together and we’re really grateful that we have a nice happy home in which to live the rest of our lives. We hear that some of our kin are not so lucky. So the moral of the story is that we’ve all given something to each other – Billie and I have a lovely new home full of love, Rupie has two new friends to play with (and boss around! ), and Kylie and Mike have had the opportunity to experience the joy of caring for us and watching us flourish into wonderful pets. Thanks for reading our story – please consider adopting a greyhound when your circumstances allow. Categories: Short Stories, Welfare Campaigns | Tags: adoption, Amazing Greys, foster fail, love | Permalink. Ha, yes they certainly seem to manage ok on 3 legs. April does have a pram for longer outings, but there’s not much she can’t join in with! Shhh, I won’t tell Max! Ahh so lovely to see your pack, my dear…..still crying for our beautiful Millie, but she lived until 14 and had a very happy life with loads of love, so I know she was one of the lucky ones. Hugs to you all from us!